IBM - 13N2195 IBM - SERVERAID 6I+ ULTRA320 SCSI RAID CONTROLLER WITH 128MB CACHE (13N2195). CLEAN TESTED. IN STOCK. SHIP SAME DAY. IBM - 13N2190 IBM - SERVERAID 6I+ ULTRA320 SCSI RAID CONTROLLER WITH 128MB CACHE (13N2190). CLEAN TESTED. IN STOCK. SHIP SAME DAY. IBM - 06P5737 IBM - SERVERAID 4MX DUAL CHANNEL ULTRA160 SCSI RAID CONTROLLER CARD WITH 64MB CACHE (06P5737). NEW BULK. IN STOCK. SHIP SAME DAY. IBM - 01K7207 IBM - SERVERAID 3H STORAGE CONTROLLER (RAID)- U2W SCSI- 80 MBPS (01K7207). CLEAN TESTED. IN STOCK. IN STOCK. SHIP SAME DAY. Dell - D9205 DELL - PERC4 DUAL CHANNEL PCI-X ULTRA320 SCSI RAID CONTROLLER CARD (D9205). CLEAN TESTED. IN STOCK. SHIP SAME DAY. Intel - SRCMRU INTEL - SINGLE CHANNEL PCI ULTRA160 SCSI RAID CONTROLLER (SRCMRU). NEW BULK. IN STOCK. SHIP SAME DAY. IBM - 24P2589 IBM - SERVERRAID 4MX DUAL CHANNEL ULTRA160 SCSI RAID CONTROLLER CARD WITH WITH 64MB CACHE (24P2589). NEW BULK. IN STOCK. SHIP SAME DAY. 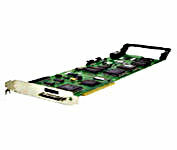 Adaptec - ASR-2005S ADAPTEC - ZERO CHANNEL 64BIT PCI ULTRA160 SCSI RAID CONTROLLER CARD (ASR-2005S). NEW BULK. IN STOCK. SHIP SAME DAY. LSI Logic - 4751010232A LSI LOGIC - MEGARAID EXPRESS 500 32MB SINGLE CHANNEL ULTRA160 SCSI RAID CONTROLLER (4751010232A). NEW BULK. IN STOCK. SHIP SAME DAY. Hewlett Packard - 403049-001 HP/COMPAQ - LSI20320R SINGLE CHANNEL 64BIT 133MHZ PCI-X ULTRA320 SCSI RAID CONTROLLER (403049-001). NEW BULK. IN STOCK. SHIP SAME DAY. Dell - NK025 DELL - PERC4 DUAL CHANNEL ULTRA320 SCSI RAID CONTROLLER CARD (NK025). IN STOCK. SHIP SAME DAY. 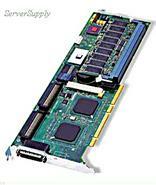 Dell - J4588 DELL - PERC4 SINGLE CHANNEL ULTRA320 SCSI RAID CONTROLLER CARD WITH 64MB CACHE (J4588). NEW BULK. IN STOCK. SHIP SAME DAY. Intel - A20135-006 INTEL - SRCU31A SINGLE CHANNEL PCI ULTRA160 SCSI RAID CONTROLLER (A20135-006). NEW BULK. IN STOCK. SHIP SAME DAY. Intel - SRCZCR INTEL - SRCZCR ZERO CHANNEL PCI-X 64BIT ULTRA320 SCSI RAID CONTROLLER (SRCZCR). NEW BULK. IN STOCK. SHIP SAME DAY. Intel - C16409-004 INTEL - SRCZCR ZERO CHANNEL PCI 64BIT ULTRA320 SCSI RAID CONTROLLER (C16409-004). NEW BULK. IN STOCK. SHIP SAME DAY. Intel - A60660-015 INTEL - SINGLE CHANNEL PCI ULTRA160 SCSI RAID CONTROLLER (A60660-015). NEW BULK. IN STOCK. SHIP SAME DAY. 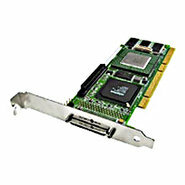 Intel - SRCU31A INTEL - SINGLE CHANNEL PCI ULTRA160 SCSI RAID CONTROLLER (SRCU31A). NEW BULK. IN STOCK. SHIP SAME DAY. IBM - 39R8815 IBM - SERVE RAID 6M DUAL CHANNEL PCI-X 133MHZ ULTRA320 SCSI CONTROLLER WITH 128MB CACHE (39R8815). CLEAN TESTED. IN STOCK. SHIP SAME DAY. Adaptec - 2001700 ADAPTEC - 2120S SINGLE CHANNEL 64BIT 66MHZ PCI ULTRA320 LOW PROFILE SCSI RAID CONTROLLER WITH 64MB CACHE (2001700). NEW BULK. IN STOCK. SHIP SAME DAY. Adaptec - 1939400 ADAPTEC - 2005S ZERO CHANNEL 64BIT / 66MHZ PCI ULTRA160 SCSI RAID CONTROLLER CARD (1939400). NEW BULK. IN STOCK. SHIP SAME DAY. Intel - SRCU42L INTEL - DUAL CHANNEL PCI 64BIT ULTRA320 SCSI RAID CONTROLLER CARD WITH 64MB CACHE (SRCU42L). NEW BULK. IN STOCK. SHIP SAME DAY. IBM - 06P5736 IBM - SERVERAID 4MX DUAL CHANNEL ULTRA160 SCSI RAID CONTROLLER CARD WITH 64MB CACHE (06P5736). NEW BULK. IN STOCK. SHIP SAME DAY. Dell - 1U295 DELL - PERC4 SINGLE CHANNEL PCI-X ULTRA320 SCSI RAID CONTROLLER CARD (1U295). NEW BULK. IN STOCK. SHIP SAME DAY. 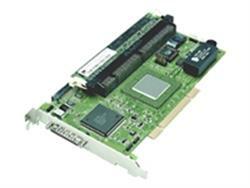 Adaptec - ASR-2120S ADAPTEC - SINGLE CHANNEL LOW PROFILE PCI ULTRA320 SCSI RAID CONTROLLER CARD (ASR-2120S). NEW BULK. IN STOCK. SHIP SAME DAY. Adaptec - 2004000 ADAPTEC - 2010S ULTRA 320 SCSI 64BIT/66MHZ PCI 48MB LOW PROFILE ZERO CHANNEL RAID CONTROLLER CARD (2004000). NEW BULK. IN STOCK. SHIP SAME DAY. Adaptec - 1957500 ADAPTEC - 2005S ZERO CHANNEL 64BIT 66MHZ PCI ULTRA160 SCSI RAID CONTROLLER CARD (1957500). NEW BULK. IN STOCK. SHIP SAME DAY. IBM - 1U294 DELL - PERC4 DUAL CHANNEL ULTRA320 SCSI RAID CONTROLLER CARD (1U294). IN STOCK. SHIP SAME DAY. Dell - J4717 DELL - PERC4 DUAL CHANNEL ULTRA320 SCSI RAID CONTROLLER CARD (J4717). IN STOCK. SHIP SAME DAY. Intel - SRCU32U INTEL - DUAL CHANNEL 64BIT 66MHZ PCI ULTRA160 SCSI RAID CONTROLLER CARD (SRCU32U). NEW BULK. IN STOCK. SHIP SAME DAY. 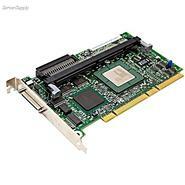 Adaptec - ASC-29320LP ADAPTEC - SINGLE CHANNEL 64BIT 133MHZ PCI-X ULTRA320 SCSI RAID CONTROLLER. (CARD ONLY) (ASC-29320LP). NEW BULK. IN STOCK. SHIP SAME DAY. 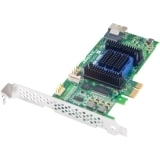 Adaptec - ASC-29320ALP ADAPTEC - SINGLE CHANNEL PCI-X ULTRA320 LOW PROFILE SCSI RAID CONTROLLER (ASC-29320ALP). NEW BULK. IN STOCK. SHIP SAME DAY. LSI Logic - PCBX520A2 LSI LOGIC- DELL SINGLE CHANNEL ULTRA320 SCSI RAID CONTROLLER CARD (PCBX520A2). NEW BULK. IN STOCK. SHIP SAME DAY. Intel - A99425-001 INTEL - DUAL CHANNEL PCI 64BIT ULTRA320 SCSI RAID CONTROLLER CARD (A99425-001). NEW BULK. IN STOCK. SHIP SAME DAY. 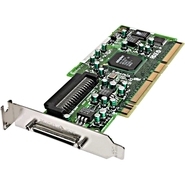 Dell - 9M914 DELL - PERC3 DUAL CHANNEL PCI ULTRA160 SCSI RAID CONTROLLER CARD WITH 64MB CACHE (9M914). IN STOCK. SHIP SAME DAY. Adaptec - 29320LP-R ADAPTEC - SINGLE CHANNEL 64BIT 133MHZ PCI-X ULTRA320 SCSI RAID CONTROLLER. (CARD ONLY) (29320LP-R). NEW BULK. IN STOCK. SHIP SAME DAY. Adaptec - 1978500 ADAPTEC - SINGLE CHANNEL 64BIT 133MHZ PCI-X ULTRA320 SCSI RAID CONTROLLER. (CARD ONLY) (1978500). NEW BULK. IN STOCK. SHIP SAME DAY. 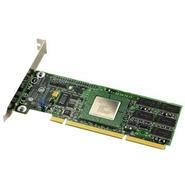 Adaptec - 1883400 ADAPTEC - 2100S SINGLE CHANNEL PCI ULTRA160 SCSI RAID CONTROLLER CARD WITH 32MB SDRAM (1883400). NEW BULK. IN STOCK. SHIP SAME DAY. 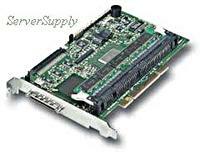 Mylex - 08P0615 MYLEX - E2000-4-64BD 4CHANNEL PCI ULTRA160 SCSI RAID CONTROLLER CARD (08P0615). NEW BULK. IN STOCK. SHIP SAME DAY. IBM - 37L6892 IBM - SERVERAID 4H ULTRA160 SCSI RAID CONTROLLER CARD ONLY (37L6892). CLEAN TESTED. IN STOCK. SHIP SAME DAY. Mylex - DAC1164P-3E MYLEX - 3CHANNEL 64BIT PCI ULTRA160 SCSI RAID CONTROLLER CARD (DAC1164P-3E). NEW BULK. IN STOCK. SHIP SAME DAY. Intel - SRCU31LA INTEL - SINGLE CHANNEL PCI ULTRA160 SCSI RAID CONTROLLER (SRCU31LA). CLEAN TESTED. IN STOCK. SHIP SAME DAY. Intel - A24967012 INTEL - SRCU31LA SINGLE CHANNEL PCI ULTRA160 SCSI RAID CONTROLLER (A24967012). CLEAN TESTED. IN STOCK. SHIP SAME DAY. 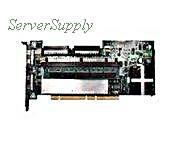 Dell - 10WMN DELL - PERC3 4CHANNEL ULTRA160 SCSI RAID CONTROLLER WITH 128MB CACHE (10WMN). CLEAN TESTED. IN STOCK.SHIP SAME DAY. 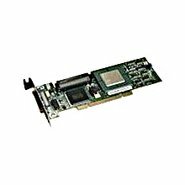 Compaq - 325609-001 HP/COMPAQ - ADAPTEC 2120S SINGLE CHANNEL PCI ULTRA320 SCSI RAID CONTROLLER CARD WITH 64MB CACHE (325609-001). NEW BULK. IN STOCK. SHIP SAME DAY. LSI Logic - LSI00032 LSI LOGIC - MEGARAID DUAL CHANNEL 64BIT/66MHZ PCI ULTRA320 SCSI RAID CONTROLLER WITH 128MB CACHE (LSI00032). CLEAN TESTED. IN STOCK. SHIP SAME DAY. Compaq - 410977-001 HP/COMPAQ - ADAPTEC 2120S SINGLE CHANNEL 64BIT PCI ULTRA320 SCSI RAID CONTROLLER (410977-001). NEW BULK. IN STOCK. SHIP SAME DAY. Hewlett Packard - 355671-B21 HP/COMPAQ - ADAPTEC 2120S SINGLE CHANNEL 64BIT PCI LOW PROFILE ULTRA320 SCSI RAID CONTROLLER (355671-B21). NEW BULK. IN STOCK. SHIP SAME DAY. Intel - C47184-004 INTEL - SRCU42X DUAL CHANNEL 64BIT 133MHZ PCI-X ULTRA320 SCSI RAID CONTROLLER (C47184-004). CLEAN TESTED. IN STOCK. SHIP SAME DAY. Intel - SRCU42X INTEL - DUAL CHANNEL 64BIT 133MHZ PCI-X ULTRA320 SCSI RAID CONTROLLER CARD (SRCU42X). NEW BULK. IN STOCK. SHIP SAME DAY. 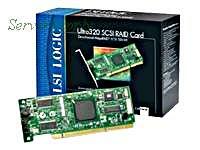 LSI Logic - 3202064 LSI LOGIC - MEGARAID SCSI 320-2 STORAGE CONTROLLER (RAID)- U320 SCSI- 320 MBPS (3202064). CLEAN TESTED. IN STOCK. SHIP SAME DAY. IBM - 25R6567 IBM - SERVERAID 6I+ ULTRA320 SCSI RAID CONTROLLER WITH 128MB CACHE (25R6567). CLEAN TESTED. IN STOCK. SHIP SAME DAY. 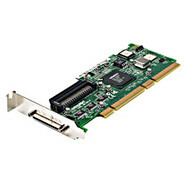 LSI Logic - LSI00028-F LSI LOGIC - MEGARAID ZERO CHANNEL PCI-X ULTRA320 SCSI RAID CONTROLLER CARD ROHS WITH 128MB CACHE (LSI00028-F). NEW FACTORY SEALED. IN STOCK. SHIP SAME DAY. Compaq - 1 CHANNEL PCI ULTRA SCSI RAID PN: KZPAC-XD MYLEX P/N: DAC(960)PU-1 OR DAC960PU-1. IBM - 37L6889 IBM - SERVERAID 4H ULTRA160 SCSI RAID CONTROLLER CARD (37L6889). CLEAN TESTED. IN STOCK. SHIP SAME DAY. 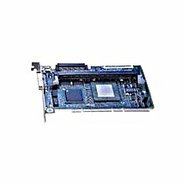 Intel - C77056-002 INTEL - DUAL CHANNEL PCI-EXPRESS ULTRA320 SCSI RAID CONTROLLER (CARD ONLY) (C77056-002). NEW BULK. IN STOCK. SHIP SAME DAY. Intel - SRCU42E INTEL - DUAL CHANNEL PCIX ULTRA320 SCSI RAID CONTROLLER (CARD ONLY) (SRCU42E). NEW BULK. IN STOCK. SHIP SAME DAY. 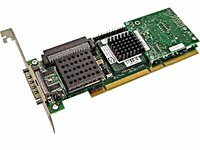 Dell - TD977 DELL - PERC 4E/DC DUAL CHANNEL PCI-EXPRESS ULTRA320 SCSI RAID CONTROLLER WITH 128MB CACHE AND BATTERY (TD977). NEW BULK. IN STOCK. SHIP SAME DAY. 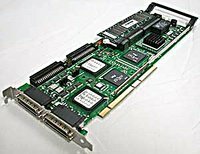 Dell - X6847 DELL - PERC 4E/DC DUAL CHANNEL PCI-EXPRESS ULTRA320 SCSI RAID CONTROLLER WITH 128MB CACHE AND BATTERY (X6847). NEW BULK. IN STOCK. SHIP SAME DAY. Adaptec - 2060100-R ADAPTEC - 29320A-R SINGLE CHANNEL ULTRA 320 SCSI RAID CONTROLLER (2060100-R). NEW OPEN BOX. IN STOCK. SHIP SAME DAY. Hewlett Packard - 192895-001 HP/COMPAQ - ADAPTEC 2100S SINGLE CHANNEL ULTRA160 SCSI RAID CONTROLLER (192895-001). NEW BULK. IN STOCK. SHIP SAME DAY. 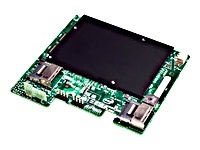 LSI Logic - LSI00192 LSI LOGIC - 9212-4I4E SAS RAID CONTROLLER - SERIAL ATTACHED SCSI SERIAL ATA/600 - PCI EXPRESS X8. NO CABLE (LSI00192). NEW BULK. IN STOCK. SHIP SAME DAY. Intel - AXXRMS2MH080 INTEL - 6GB/S 8-PORT SERIAL ATTACHED SCSI SERIAL ATA/600 - PCI EXPRESS 2.0 X8 RAID CONTROLLER (AXXRMS2MH080). NEW BULK. IN STOCK. SHIP SAME DAY.